My mother used to have a name for people who were dumber than dirt. She called them birdbrains. On the rare occasions when Mother called me a birdbrain, I knew that whatever I had done was something that she considered to be far below the potential of any daughter of hers, and that she was deeply disappointed in me. Because the last thing I wanted was to have Mother disappointed in me, “birdbrain” was the ultimate insult. 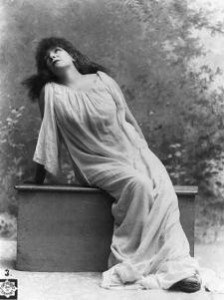 It was infinitely worse than when she referred to me as “Tallulah” or “Sarah Bernhardt,” two actresses from long before my time who were drama queens before anyone ever heard the term. Sarah Bernhardt was a drama queen long before the term was invented. Today we refer to our houseplants as “Tallulah” or “Sarah Bernhardt” when they droop on the floor as though they’re dying just because we’ve neglected to water them. (You’d think they were starving, the way they act! What whiners they are!) But I never call people birdbrains. “Birdbrain” is still an insult that is stronger than anything I care to use. I used to think that Mother called birdbrains, “birdbrains,” because the brains in birds are very small. It took an incident with birds to learn exactly how stupid birds really are. When we first moved to Virginia, we lived in a house that had a porch light directly next to the front door. This porch light was decorative — or as decorative as a porch light can be when the builder had a budget of thirty-nine cents for outdoor lighting. 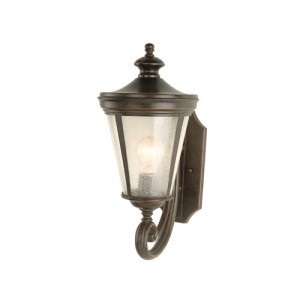 This porch light was designed to look like traditional carriage lighting. It had a tapered bottom and a point up at the top. The point up at the top is what’s important here. This resembles our front light, with the pointy top. One spring, a pair of birds took it upon themselves to build a nest right on top of our porch lamp. Yes, they used the little ball at the top (although in the case of our lamp it was a point) to use as the base for their nest. We had plenty of flat surfaces they could have used. No, they had to build their nest so it was balanced precariously on top of the pointed carriage light. No sooner did they finish building their nest than they did what birds do — the female bird laid a clutch of eggs in her nest. Once she was sitting on the eggs, even she must have realized what a stupid spot she had chosen for her nest. Every time she switched positions, the nest threatened to topple. Indeed, it would have toppled almost immediately if Fluffy and I hadn’t taken duct tape and done our best to tape the nest to the siding behind the lamp. The problem was only exacerbated because our front door lamp was, well, immediately next to the front door. Every time we left the house, or every time a visitor came to the door, the bird would panic. She’d flap all over the place, waiting for the intruder to leave so she could return to her not-so-private real estate and take care of her future brood. All went fairly well until the baby birds hatched. Although the parents were at least dimly aware that the nest was in a precarious position, the three baby birds had no idea that their home was perched on a precipice. They tumbled around the nest the way baby birds do, until the nest inevitably overcame the duct tape and fell to the ground. All three baby birds were killed on impact. I cried for the rest of the day — as much because the parents were so stupid as for the loss of the baby birds. I tend to think of myself as a pretty smart cookie, yet I can’t help but wonder how many decisions I make that are just as boneheaded — just as birdbrained — when seen through the eyes of God as those birds’ decision to build a nest on a pinnacle was to me. For that matter, how many decisions do I make that look just as stupid to the people around me? It’s so easy to see the mistakes of others, and so difficult to see our own shortcomings. I am doubtless spending part of every day building my own nests on pinnacles, but I’m not smart enough to see it. I’m sure it isn’t easy to be God, and to see us all making huge mistakes even as we try to do our best. I’m so glad for the principle of repentance. When the nests I build on pinnacles come toppling down and I finally understand what I've done wrong, I can repent. I can learn from my mistakes and I can be forgiven. I may still have to suffer the natural consequences of my actions, because that is part of what this world is all about, my spiritual self can be refreshed and I can become new again. Being able to learn from our mistakes is what sets us apart from the birds. That, and not being able to fly. In the long run, being able to repent is even better than having wings. We human beings can soar, but in a different way.